Why did you choose to write this particular story? The Pale Ancient & the House of Mirrors has two big inspirations: Unsavory Elements and the documentary Though I Am Gone. I made a return trip to China in March, 2014. We stayed in my wife’s hometown, a small town in Hubei province. I read Unsavory Elements while there and had the idea to do a story like that, where different people told different stories about their experiences in China, all tied together by a lengthy plot. I intended parts of it to be a deconstruction of expat writing. I began writing it, and I hit a wall; the story didn’t feel right to me. I liked to ride my father-in-law’s bicycle around my wife’s hometown and out into the country. While out there, I rode past an abandoned house with one of those small mirrors above the front door, the bagua mirror. Just down the road was a small temple. I thought, what if the house and the temple were connected? Who were these people? Why did they leave? Who was inside the temple? I also noticed messages taped around my wife’s hometown. Some old, some new, I asked my wife. She thought they had something to do with Buddhism. 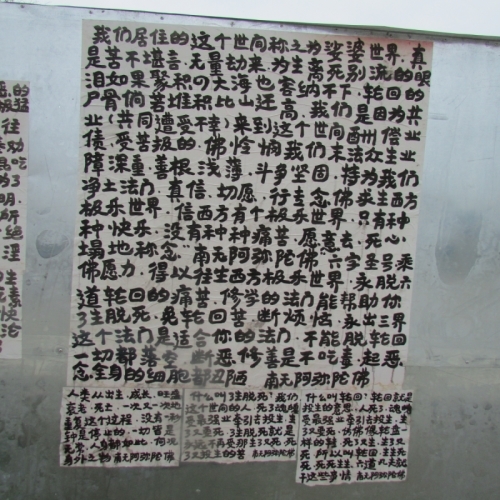 But once I noticed one message, I noticed all of them; they were all over the place, mysterious, perhaps sinister. And not all these messages were new. Some were barely readable while others looked like they’d been posted yesterday. Someone had been doing this for years. Why? With all this in the back of my mind, I returned to the States and a couple months later I thought of the house, the temple and the messages, and perhaps a young woman who accepted a friend’s invitation to visit the town. 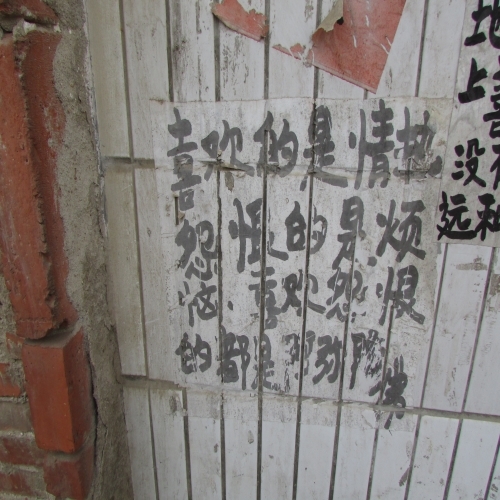 The man who invited her wants to show her what he considers “real China”, but what if she saw the messages? What if they led her to something dangerous? Is The Pale Ancient & the House of Mirrors semi-autobiographical in nature? There are elements of my own life in there, particularly my 2014 China trip. Coming back after three years, I saw how much had changed. I also saw things differently too. Mary’s part is very much from my return trip. Chris’s part, set in 2007, draws from the optimism you feel during your early China years as well as my own experiences of studying at Wuhan University. Daniel’s part, set in the present day, is less about me than it is about people in general. Daniel clings to an idealized version of the past. He runs a China blog that enjoyed a very good run a few years ago. Today it’s nothing, but Daniel won’t face it. All of the writers from the blog’s heyday have left China, moving on with their lives while Daniel still acts like it’s 2009. Daniel also has marital problems. He avoids these too; he won’t face the fact that his wife would rather wash down sleeping pills with wine than spend time with him. Daniel talks to a fortune cat he named Steve. Steve talks back. But no, I don’t talk to a fortune cat and my wife doesn’t pop pills. For Daniel, it’s the inability to see how damaged his life is. Daniel could easily fix all his problems; he’s just too cowardly to do it. What kinds of themes in literature are interesting to you? Life and death, the big ones. I’m interesting in how people change, or don’t change. The passage of time, it’s effects on the mind. Our limited time here, and what we make of it. The distractions we invent, the few who face it head-on. I wonder a lot about the people I worked with back in 2008 China. What’s happened to them? One of my classmates from Wuhan University, I looked him up on Facebook the other day. Can you guess what he’s doing? Living in the same city, going to the same clubs, partying just like he did five years ago. The rest of us from my class have left China, but this guys has stuck around, partying in a smoggy Never-Never Land. I’m also interested in how places change and the effect it has on people. Look at how much not only Wuhan but my wife’s hometown has changed. What other changes are coming? You have a favorite place, you have memories there, and one day it’s been knocked down. A lot of that came out in The Pale Ancient & the House of Mirrors. What would you like readers to learn about China? I hope they see China is a dynamic country that like every other place has its charms and its warts. But the conclusions that people draw about China, it’s out of my hands. I can steer as best I can, but they still have pull the ship into port. This entry was posted in Interviews and tagged China, Cormac McCarthy, esl, expats, Final Fantasy, interview, Travis Lee, unsavory elements, writing by Ray. Bookmark the permalink.